Get up-close and personal with some of the largest, strangest, and most curious creatures in the Pacific along side naturalist and wildlife photographer, Ty Diffin. Created with adventure and education in mind; tours focus on quality information, fleet, equipment, and amenities. A morning excursion to the Marietas Islands is the ultimate marine safari chalked full of adventure and marine life encounters... Watch for whales, dolphins and sun-bathing turtles on the 15 minute ride to the Islands... Snorkel the island's reefs in search of stunning eagle rays, gregarious schools of tropical fish, wildly bizarre invertebrates, and more.... 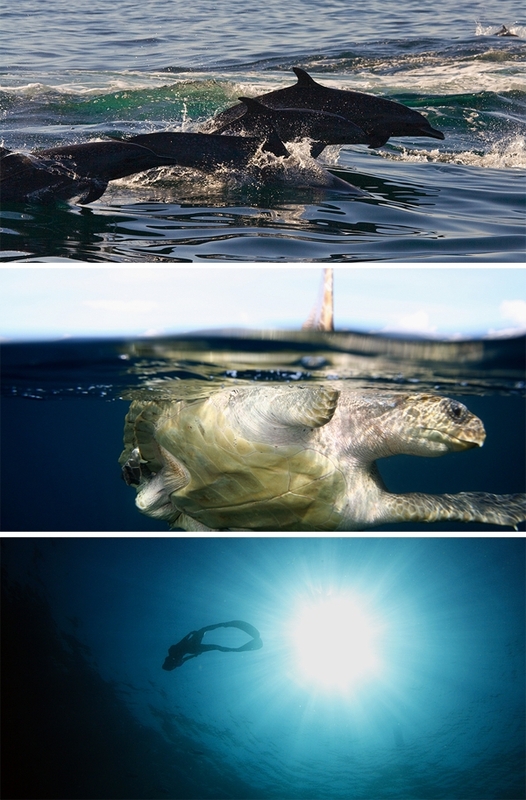 Swim and walk through its plethora of volcanic tunnels... Find hidden beaches... Feel the spray from its massive spouting blowholes... Exchange glances with some of the world’s rarest marine birds... All this and some wild surprises along the way! Bring sunscreen and/or hat, swimwear, light jacket or sweater & camera. For the sea worthy experienced boaters and/or snorkelers, this trip is THE trip! 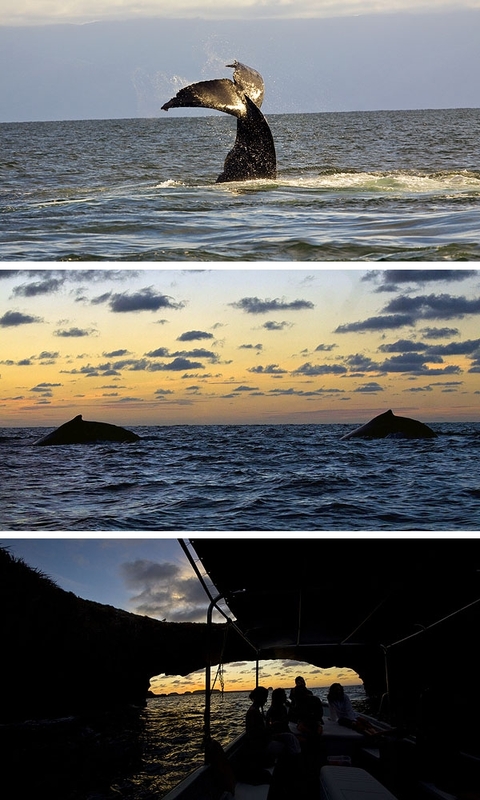 DEC-MAR: Cruise the bay along side of glorious Humpback whales and observe their complex behaviors up close and personal... Dramatic displays of strength and agility by desperate males lauching their 50 ton bodies into the air... Intimate moments with mother and calf pairs as females nurse and teach their newborns,... Intense groups of males involved in aggressive competitions for available females... charming play sessions of calves as they awkwardly practice the movements and displays that they will need for feeding and social interaction... spine tingling sounds of male humpbacks sounding their hauntingly beautiful mating songs... Add some turtle and dolphins sightings along with a few other surprises... More that you ever expected! 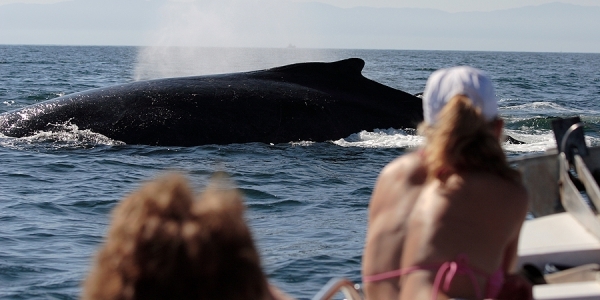 Come enjoy whale watching in a whole nother light. The light boat traffic of the late afternoon make it the best time for us to slide the hydrophone in the water and enjoy an uninterupted listen to the male mating songs. 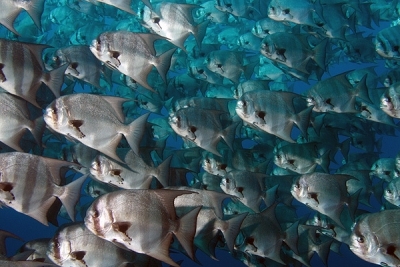 Keep an eye out for other residents of the bay as we chance upon dolphin, sea turtles, rays and drive past the Marietas Islands. Enjoy hor'doeurves, wine and beer seated in the most gorgeous setting of the bay as we toast to the closing of another gorgeous day. Bring sunscreen and/or hat, light jacket or sweater & camera. The "panga" provides infaliable stability, amazing manueverability, and a low profile. In our case, that translates to intimate, dramatic, and nearly eye-level encounters with the bay's marine life. Our modern versions of the panga have all of today's standard safety equipment, a shade roof, and a slightly veed bottom to attain a compromise of stability and comfort. 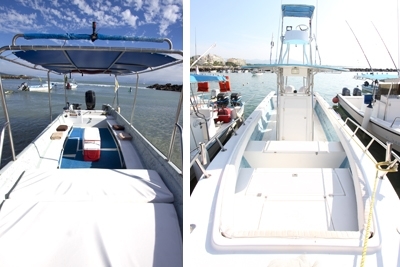 The 27' panga is great for small groups of adventurous passengers while Punta de Mita's only 31' panga is the ultimate for comfort and luxury, recommended for large groups and/or those who just want to assure a smooth, dry ride. Naturalist, wildlife photographer, and waterwoman, Ty has been sharing inspiring experiences with her on-board guests for over 13 years. Daughter of a U.S. Navy man, she grew up traveling the coasts of the world until moving to Mexico in the summer of 2000. She has since enjoyed a life of surfing and diving along its shores, basking in the company of whales, dolphin, and the entire host of marine life that inhabits the local volcanic reefs. Through the sharing of experiences on the water and her studies and stories, Ty enjoys bringing a taste of her relationship with the local area and its marine life to her guests. While occasionally last minute reservations can be accomodated, at least 24 hour advanced reservation is requested with several weeks notice recommended for peak season dates. A 50% deposit is requested via paypal. Client cancelation within 24 hours is non-refundable. Please treat yourself with care the evening before our excursion. Our goal is to give you a good experience. If we feel that the weather conditions are inconducive to a safe, enjoyable excursion, we reserve the right to postpone/cancel the excursion with a full refund. Shared charters are available as shown in the availablility schedule and can be requested in advance for peak season times. 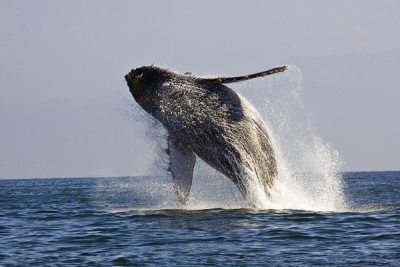 Shared charters typically offer a combination of activities including wildlife/whale watching and a brief snorkel. We love families! Please specify ages and sizes for young children. Your guide will be sure to have appropriately sized equipment and safety gear as well as taking care to include them in educational dialog about the local wildlife. 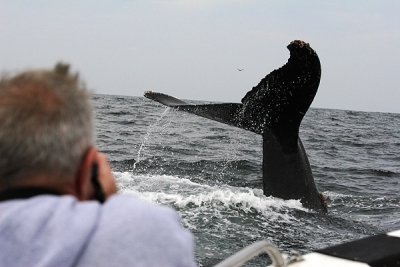 Whale watching is appropriate for all ages and experience levels. 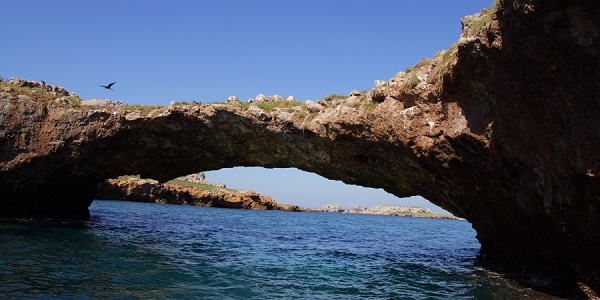 Marietas Island snorkel in-water activities are appropriate for ages 5 and up with swimming experience. A life jacket can be used by anyone for extra flotation. 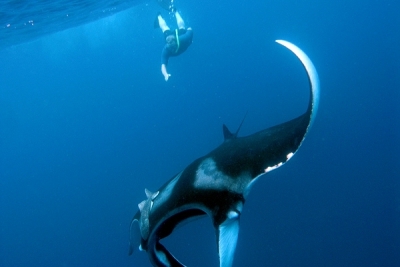 The wildlife safari is a custom excursion based on your individual skill levels, but is best enjoyed by experienced snorkelers or free divers. Weather tends to be sunny with smooth ocean conditions in the morning. Water visiblility varies with changing currents (avg. 25-40'). Early morning conditions tend to be smooth and pick up a bit as the morning moves on. Water visibility varies (avg 15-30'). In the small, open-air style boats we use, sea sickness is usually not an issue; however, if you are particularly prone to motion illness, an over-the-counter anti-nausea medicine should do the trick. If you choose one that causes drowsiness, be sure to take it 2-4 hours before the excursion to allow the drowsiness to wear off. For a natural solution, you can take ginger as a supplement or in candy, gingerale, or raw. On board you will be introduced to some on-the-spot tricks of the trade as well.